If you haven't heard of it before - StumbleUpon is a website used to discover web sites based on your interests. When you register (free) you list your interests. You get a nifty lil button added to your toolbar and whenever you want, simply click the Stumble button to be taken to a random website that matches the interests chosen. I have found so many interesting websites this way. Check it out - very easy - very cool - works for me! 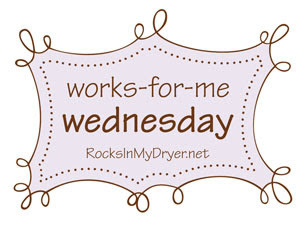 For most great Works for me Wednesday tips, check out Rocks in my Dryer. Ohh, StumbleUpon is awesome! Love it! I like that it bookmarks the site on their server rather then you having to list it in your favorites on your computer. I have found lots of websites from "Stumbling".